As many regular sportschump readers know, one of my best friends, Croshere, is a proud alumnus of THE Ohio State University. And as many of you sports fans know, Buckeyes are among the most passionate fans around. Can I get an O H!!! Unfortunately for Croshere, he also has a bad habit of leaving his Ohio State gear behind when he comes to visit. This time around, I decided to have a little fun at his fleece’s expense. I hope you enjoy the pictorial. I would like to thank Visual Communications, Inc. for their time, photographs and directorial wisdom. I’d also like to thank Ohio State football coach Jim Tressel, fondly referred to as ‘Jimmy T’ in the Croshere household, for swinging by the SportsChump studios. Coach Tressel and I, seen here, kick back on my sofa to watch the Ohio State-Michigan Big Ten tournament game. 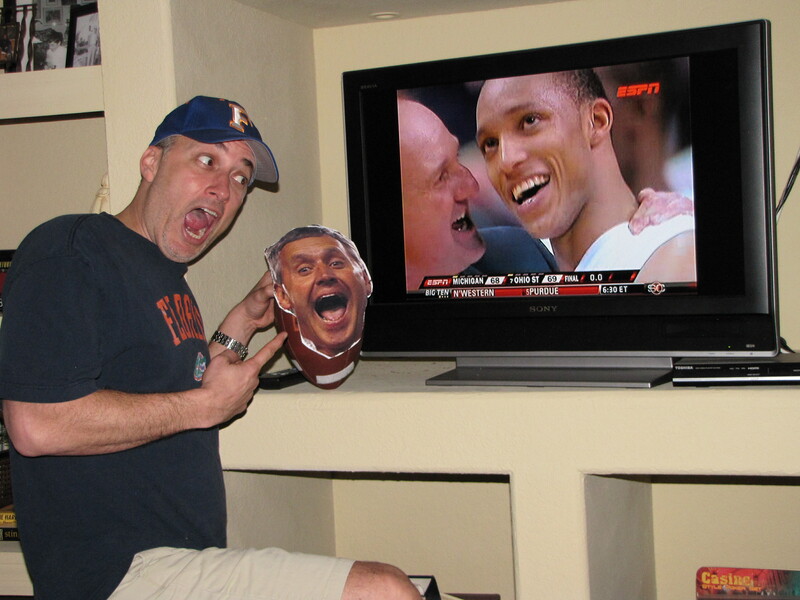 As you can see, he’s very excited about March Madness. 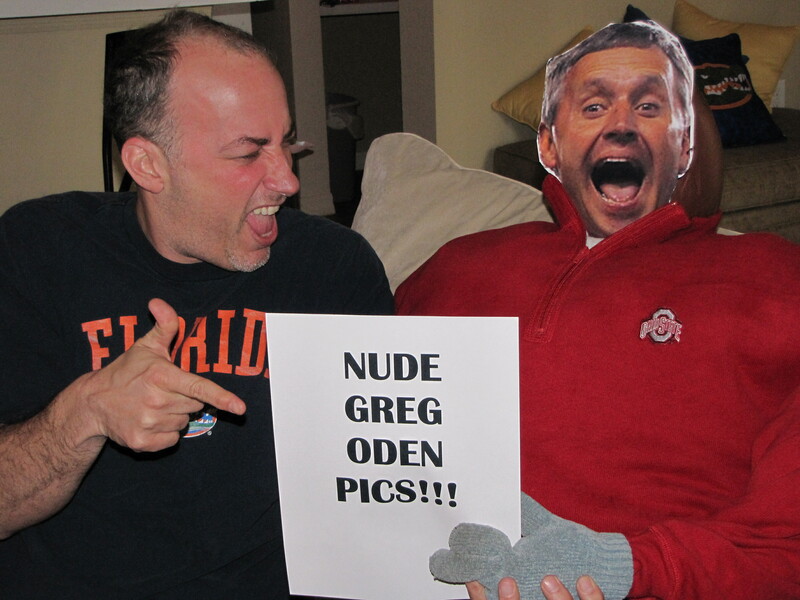 Coach Tressel and I discuss some of the finer work Ohio State athletes have done since turning pro. 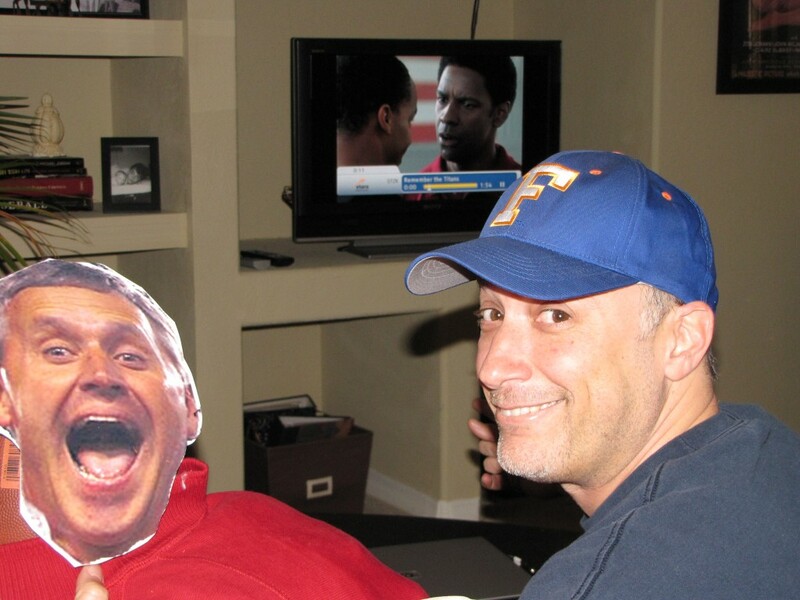 At half-time of the basketball game, Jimmy T and I watch highlights of our favorite movie, “Remember The Titans.” Sometimes, Coach Tressel will use it in the locker room for motivational purposes. Who’s your daddy, Gary? 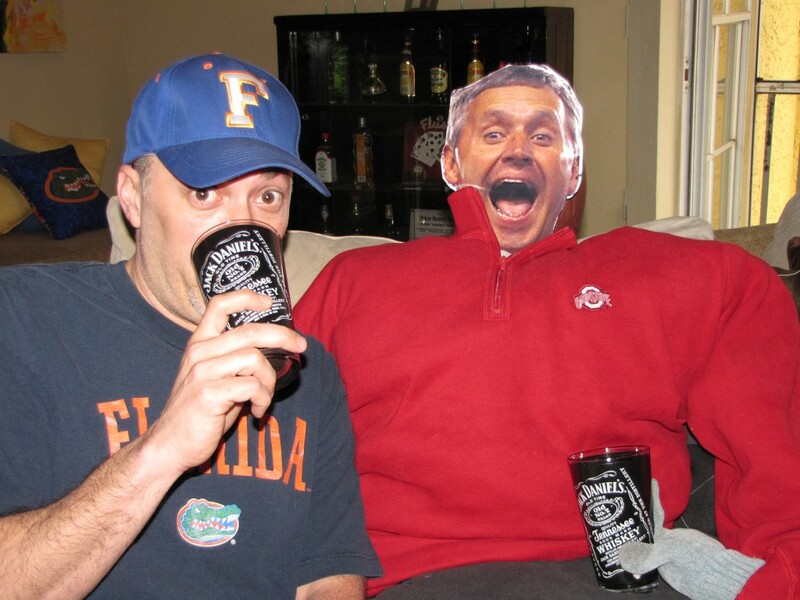 As is tradition with most sporting events, Jimmy T and I like to enjoy a refreshing Jack Daniels cocktail. Whoops! Looks like Jimmy had one too many. 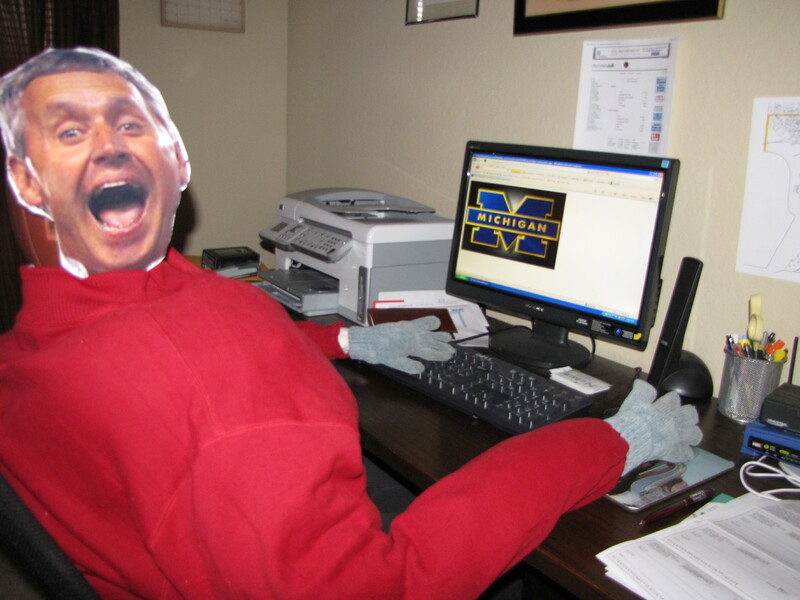 After waking from a peaceful slumber, Coach likes to surf University of Michigan websites to check on the competition. Coach Tressel loses his head as he and I celebrate the greatness that is Evan Turner. *No coaches were harmed in the making of this blogpost. This entry was posted in Hardwood, Life of Sports Chump, Pigskin, Screen and tagged Croshere, Evan Turner, Greg Oden, Jim Tressel, Michigan Wolverines, Ohio State Buckeyes, Remember The Titans by Chris Humpherys. Bookmark the permalink. I see you like that famous Ohio State head. Man, this is freakin’ awesome. Nice work! Nice photos from Visual Communications, Inc.!! Sup Mom! Man, I’ve been dying here for a few. 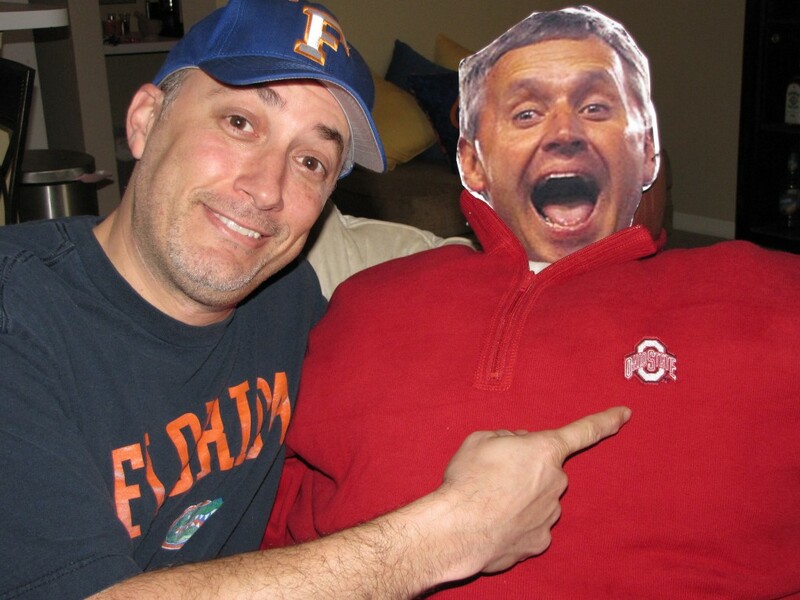 Priceless… Glad you removed the photo of Tressel kissing Urban Meyer’s bum. 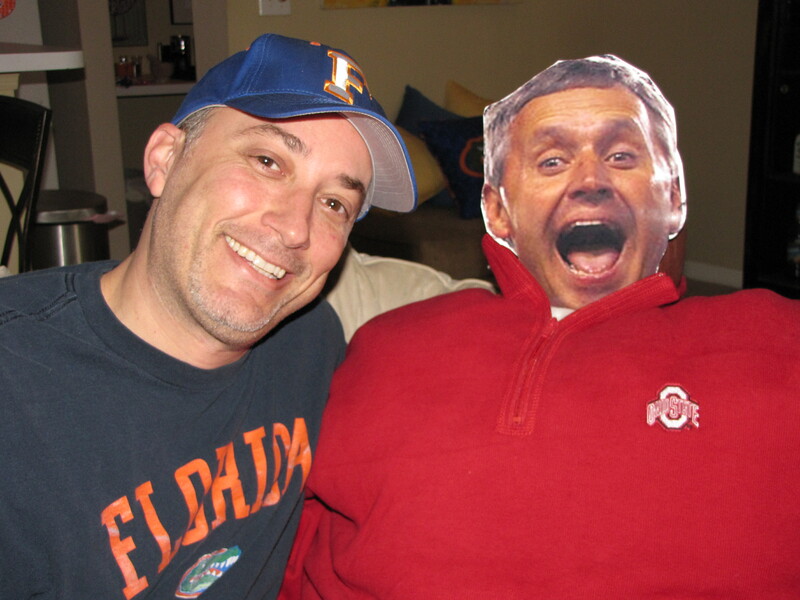 Croshere didn’t leave his Jim Tressel blow-up doll behind so I had to make do. I figured those pics could be found anywhere on the internet so I tried to come up with something a touch different. Stay tuned for the Croshere family’s comments and don’t forget to hit Carlos n Charlies while you’re there. Always go back to the original unit. There’s our first visit from a Buck. I can’t fault you for that ! But I’d have thought you would’ve had life size poster or wallpaper image of Sofia Vergara to make you feel comfy rather than Jim Tressel ? But as they say whatever floats your boat. The Most Interesting Man In The World ? But Who To Your Mind Is The Most Reviled Man In Sports ? Nice beach towel, you wear it well. Nice towel, you wear it well. That’s an entirely different post, Al. You know I tackle the tough sports issues of the day. As witnessed by this post. It’s all in the production value. Well since it’s been either freezing cold or pouring rain in Florida these days, I figured I might as well put the towel to good use before I am able to tan. I’ve just now finished watching the bout between Clottey and Pacquiao. And apparently one of the judges had Clottey winning a round. I think he must’ve have left his seeing eye dog at home or something. Pacquiao threw close to 800 plus punches over the 12 rounds and landed close over 50 % of them . And Clottey’s punch stats were abysmal. No wonder the sport is in the crapper . Bob Huggins actually gets emotional and sheds a tear ? I know there’s meant to be no crying in baseball . But what about men’s basketball ? Does that count ? Al… One thing could save boxing. Pacquiao-Mayweather. But that’s not going to happen. I hereby propose that you become boxing commissioner. First order of business. Make that fight mandatory. Al… I hear Huggins cries every time he steps on a scale. Huggins cries every time he gets behind the wheel of a motor vehicle. And that’s something that I for one don’t particularly like . Given the guys proclivity for drinking while impaired. Need I say anymore on the matter ? The Mavericks aspire to be world beaters in the NBA ? Much like the French did during WWII . And we all know how that ended up don’t we ? They kick the Knicks’ a_s all up & down the Gardens but on their homecourt they get blown out by 34 points by the same damn team ? Geno Auriemma’s U Conn Huskies (women) would give them a run for their money and maybe even a scare or two. That’s how bad the Mavs are ! They’re doin’ it with smoking mirrors . If that’s the case, Al, then there’s a lot of athletes a-cryin’ these days. And don’t forget about your boy, Tony LaRussa. Al, it’s the NBA. Any team can beat another on any given night. I didn’t catch the game and I agree with you, there’s no reason the Knicks should be shelacking the Mavs like they did. I think they’ll be fine in early June. It’s late June that they’ll be bounced. Al… I hate to break it to you but the Mavs are currently better than the Spurs. Ok, I gave up blogging until after this quarter but I HAD to respond to this! You have outdone yourself here sir. Jimmy T would be…er.. was so proud to hang with the Rev. Looks like you two hit it off pretty good. Even got him to loosen up a bit. 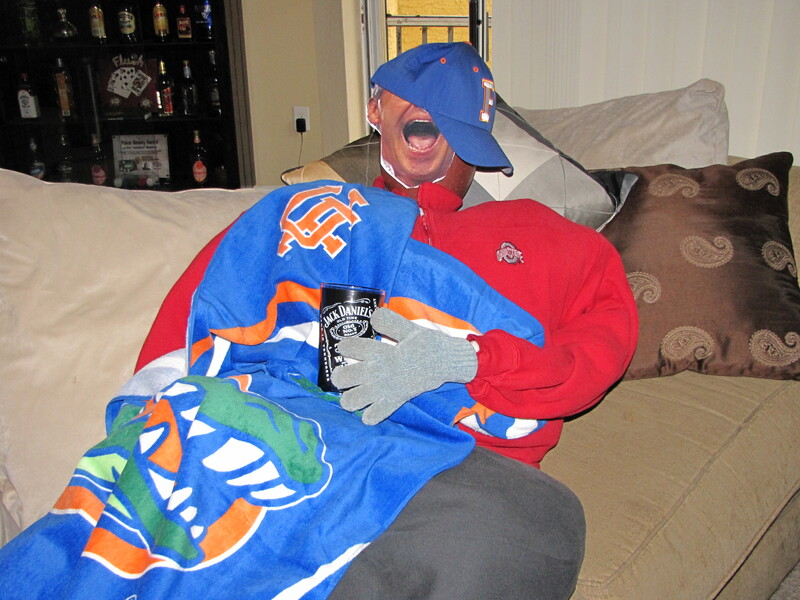 Tell your boy to keep track of his Buckeye gear before JT ends up in a compromising position with Lou Holtz…kind of. Very funny. Now how bout them Buckeyes!? Oh my…. ha ha. Evan Turner from near halfcourt… guess he’ll do that to ya. No team should allow another a 32 point turnaround and get shellacked the way that the Mavs did. Like I said the team’s psyche is poor and they will fold like a cheap suit ! They won’t get by either the Nuggets or Lakers . And their bench isn’t as strong as some might believe. I see that the Jets have signed LT ? And TO is still out there treading water . I hear he’s now prepared have a sandwich board hanging around his neck saying ‘will work for food’ ? 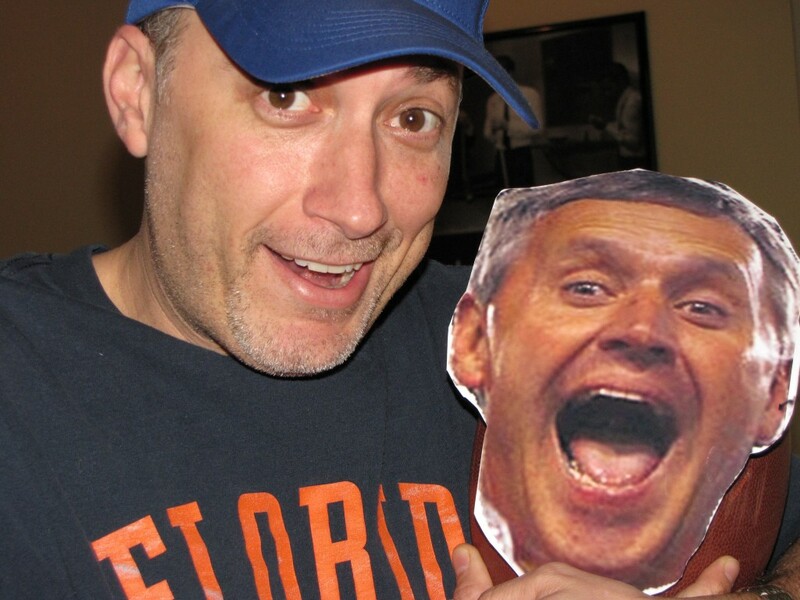 Pete… I love the Buckeyes chances this year. Tough bracket but there’s is as good a shot as any to come out of it. I’m about to put up a bracket contest so make sure you represent Buckeye Nation. It should be up later today. Sorry to hear you stopped writing. Jimmy T would probably not approve. Besides, Urban Meyer was looking forward to your rebuttal. KP…. as you can see, it didn’t take long for Petey Nice to come out of hiding. To be perfectly honest, I think he was just jealous I got to spend so much time with his man. We didn’t even get to go sweater vest shopping. Al… you still didn’t answer my question. Are the Mavs better than San Anton. And I think you’re right about LT and Ryan. How long until we see LT start pouting because Ryan was a little rough on him. Record simply suggest that they are better. But what there’s no way in hell that the Spurs would’ve beaten like a drum like the Mavs were . Does that answer your question ? Without Parker as the swingman in the postseason , the Spurs will suffer. 50,000 people can’t be wrong for turning up at Texas Stadium for the Pacquiao Clottey fight can they ? The undercard was extremely bad and the main event itself was just as bad . And people still shelled out between $39-95 to $44-95 to watch it all. And Bob Arum described it all as a resounding success . I guess he would, considering he made out like a thief in the night walking away with so much swag ! LT’s psyche is just as soft as Tiger’s and the Mavs combined. God knows what’ll happen if Sanchez gets in his face. He’ll probably end up crying. The thing I’ve got to ask is what the hell is going on inside of the Jets’ front office ? They let Thomas Jones go and sign LT for more money than they actually offered Jones ? What’s up with that ? I guess I’ll buy that answer, Al. I know it’s only March but I am BEYOND ready for some NBA playoffs. And I’m still waiting for a reason to pay attention to boxing these days. Since Congress is so involved in sports these days, why the hell don’t they get involved in putting that damn Pacquiao-Mayweather fight together? I think I’ll be taking the Jets win total under this year. Last year might have just been a flash in the pan. Careful not to leave your Bobby Hebert jersey laying around next time you pop into town.